All-wheel drivers may soon get record fuel economy. Mitsubishi is showing a crossover SUV with AWD in Tokyo which is likely to go on sale U.S. in 2012 or 2013. The MITSUBISHI PX-MiEVⅡ is a midsized plug-in hybrid (PHEV) with a 500-mile cruising range. The PX-MiEV is a 5-door, 7-passenger SUV with all-wheel drive. Mitsubishi is the third biggest seller of electric cars after Nissan and General Motors. In Japan, over 5,000 drive its popular city car the MiEV. Now U.S. buyers are ordering the slightly larger Mitsubishi i that impressed me when doing a Mitsubishi versus Nissan LEAF test-drive comparison. The Mitsubishi i with a starting price of $29,125 will appeal to many city drivers. Others however want a range of hundreds of miles not 62. Many want a car with more passenger and cargo space, leading Mitsubishi to start showing a new concept car in Tokyo which is likely to come to the U.S. in the future as a commercial EV. The MITSUBISHI PX-MiEV Ⅱ is a small crossover SUV plug-in hybrid (PHEV) with a 500-mile cruising range. The PX-MiEVⅡ contains a powerful electric drivetrain derived from the popular MiEV that delivers the performance and quiet ride inherent to an EV. The PX-MiEV is a 5-door, 7-passenger SUV with all-wheel drive for better handling on wet and snowy roads. 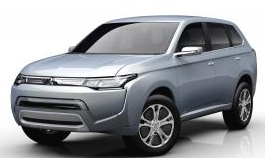 The Concept PX-MiEV uses a newly developed twin-motor four-wheel-drive system mated to Mitsubishi’s S-AWC (Super-All Wheel Control) advanced traction control system. This unique plug-in hybrid fuses EV technology derived from the i-MiEV with a small conventional engine to deliver a combined fuel efficiency (3) of more than 141 miles per gallon (60km per liter) and a range of about 500 miles between gasoline fill-ups. This new concept SUV has a 30 mile all-electric mode range, meeting most daily needs of U.S. drivers without using any gasoline, just a garage electric charge. Depending on power consumption and remaining battery charge the system will start the engine automatically as a generator, and the engine can also be used to help drive the wheels as necessary. In addition, with the push of a button, the driver has the freedom to select Battery Drive Mode when he/she wishes to drive quietly in residential areas using pure EV power. At the same time, the driver can also switch to Battery Charge Mode while on the move, controlling use of battery power and using the engine as a generator to charge the batteries. This electric SUV has a socket so that contractors can run power tools using energy stored in the PX-MiEV’s lithium battery pack or to run auxiliaries when camping. In addition, the quick-charge port is vehicle-to-home (V2H) compatible. We look forward to the Mitsubishi PX-MiEV coming to America with its 500-mile range, SUV room inside, cargo flexibility, AWD safety, and power the auxiliaries we use in work and play.